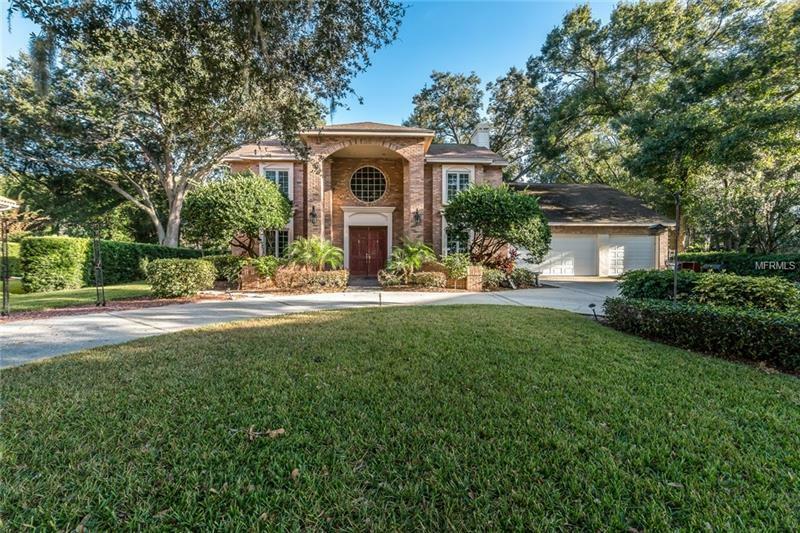 Carrollwood ESTATE HOME w/PRIVATE SKI LAKE access! PERFECT for the active family. This executive beauty sits in a unique gated community of only 8 homes featuring PRIVATE DOCK AND BOAT RAMP ON TO SKI LAKE, LAKE CARROLL! Surrounded by larger more expensive homes, this home has the bones to have instant equity! Put your finishing touches & your own great taste into this home to make it your DREAM HOME! As you drive into the neighborhood you will enjoy the beautiful homes on the way, the lush landscape & lake view. This home is situated on a cul-de-sac & sits on over a third of an acre lot with a circular driveway leading you to the spectacular front brick elevation & covered entry. The foyer features high ceilings, a beautiful spindle staircase & lovely round window w/views of the lake from the second story loft area. The open views from all living areas showcase the pool & lanai and expansive fenced back yard. The master bedroom is large and located on the first floor w/direct access to the pool. Upstairs you will find 4 additional bedrooms w/2 additional bathrooms, a loft & a huge bonus room which would make an excellent theater room, game room, teen retreat or in-law quarters. Recent upgrades include a new roof (2013) and newer A/C. You don't see many neighborhoods like this! Take advantage of this rare opportunity to purchase a home w/great bones for a great price & make it your own dream home. Priced to sell! Don't wait to schedule your private tour. Give us a call today!